United States Pharmacopeia (USP) - The United States Pharmacopeia (USP) is the official pharmacopeia of the United States, published dually with the National Formulary as the USP-NF. Prescriptions and over-the-counter medicines and other healthcare products sold in the United States are required to follow the standards in the USP-NF. The USP also sets standards for food ingredients and dietary supplements. Chapters in the USP that are listed as below 1000 are considered enforceable, while chapters enumerated as 1000 or greater are considered guidelines. Therefore, USP 797 and USP 795 are considered enforceable, while USP 1075 and USP 1160 are simply considered guidelines for best practices. Material Safety Data Sheet (MSDS) - OSHA-required notices on hazardous substances which provide hazard, handling, clean-up, and first aid information. buffer area - An area that is required to be ISO class 7 or better. A primary engineerirng control (PEC) such as a laminar airflow workbench would be located in this area. Extemporaneous compounding, often just called compounding, is a necessary skill for many pharmacists and pharmacy technicians. Many compounders will use the Latin term secundum artem (according to the art) when referring to the skills required to prepare these products. Extemporaneous compounding can be defined as the preparation, mixing, assembling, packaging, and labeling of a drug product based on a prescription from a licensed practitioner for the individual patient in a form that the drug is not readily available (extemporaneous = impromptu, compounding = the act of combining things). Extemporaneous compounding is required for prescription orders that are not commercially available in the requested strength or dosage form. There are two types of pharmaceutical compounding, sterile (ophthalmics, IVs, parenteral nutrition, chemotherapy, and various other injectables) and nonsterile (creams, ointments, oral suspensions, capsules, suppositories, medication sticks, troches, etc.). Regardless of the compounding category, there is a general order of work for all extemporaneous compounding. By following a procedure you will be able to work more effectively. Carefully read and interpret the prescription or medication order. Note any missing or confusing information; clarify, gather, and add this information to the drug order. Check the dose,dosage regimen, dosage form, and route of administration for appropriateness. Determine a preliminary compounding procedure. Perform necessary calculations. If possible have a colleague check calculations. Select required ingredients. It is the responsibility of the pharmacist to choose appropriate quality ingredients for compounding. The preferred grade for this is USP or NF. If an official USP or NF ingredient is not available, the pharmacist should use professional judgment in the selection of an alternative source so that the safety and purity of the ingredient is assured. This may require requesting a certificate of analysis from the supplier. Using recommended techniques, prepare the product. A visual inspection of the product should be done. Choose an appropriate container and package the preparation. Determine an appropriate beyond use date. Label container and include recommended auxiliary labels. Extemporaneous compounding brings with it its own safety concerns. There is a vast array of information to be aware of with safety requirements depending as to what kinds of chemicals you are working with. Of particular concern is infection control through proper hand hygiene and personal protective equipment, and proper handling with regard to disposal and waste management. Infection control is concerned with preventing nosocomial or healthcare-associated infection. Infection control addresses factors related to the spread of infections within the healthcare setting (whether patient-to-patient, from patients to staff and from staff to patients, or among-staff), including prevention via hand hygiene and through the use of personal protective equipment (PPE). When assembling CSPs, preparers should don personal protective equipment (PPE) to further minimize the likelihood that they will contaminate the final product. USP 797 provides requirements for how personnel should wash and garb including the order that they should don their PPE, from dirtiest to cleanest. First, personnel should remove unnecessary outer garments and visible jewelry (scarves, rings, ear rings, etc.). Next, they should don shoe covers, facial hair and hair covers, and masks (optionally they may include a face shield). Next, they must perform appropriate hand hygiene. Proper waste stream management is very important in pharmacy as mismanagement can have negative impacts on the community, the environment, and can cause fines to levied against a pharmacy or health care facility. Waste that poses no ecological threats, is devoid of protected heath information, and poses no major safety risks may be disposed of in regular waste receptacles. Broken ampules, syringes, and various needles need to be treated with caution to avoid accidental needle sticks and/or cuts. If the medications or diluents that these sharps were exposed to are not classified as hazardous, then you may dispose of this waste in red sharps containers. Properly labeled, leak-proof, and spill-proof containers of nonreactive plastic are required for areas where hazardous waste is generated, and can be further broken down into either yellow or black containers. Fully used vials, syringes, tubing, and bags of hazardous drug waste along with PPE used while working with hazardous drugs may be disposed in yellow, properly labeled containers. Also, any partially used or expired hazardous drugs that are not also considered to be RCRA (Resource Conservation and Recovery Act) regulated hazardous drugs should be placed in these yellow buckets. Trace contaminated items such as booties, gowns, and masks, even if they were not involved in spills, MUST be treated as hazardous waste (the yellow buckets are sufficient for this). Documentation of extemporaneously compounded medications is an important responsibility within the pharmacy as it provides a chain of accountability for the preparations and it aids in tracking drug recalls. Documentation can be broken into two major categories, record keeping and labeling. Whenever preparing any extemporaneous compound, the minimum information to maintain would be a method for tracking whom the compounder(s) is/are, whom verified that the procedures for compounding were carried out correctly, and drugs/chemical used including manufacturer, lot number, and expiration date, and an internally assigned batch number and beyond use date. Many facilities will also track information on all the equipment used in preparing the compound. Sometimes facilities will compound batch preparations. A batch preparation is one in which multiple identical units are prepared in a single operation in anticipation of prescriptions. Some examples of batch preparations might include preparing 100 capsules for hormone replacement therapy when only 30 have been ordered, or preparing 10 IV minibags of the same drug at the same concentration from a bulk container when only two have been ordered. These preparations are being made in anticipation of additional orders being received in the pharmacy. Since none of these medications will be dispensed or sold without a specific patient in mind, it does not cross the line from compounding to manufacturing. Documentation must also be maintained on all of these batch preparations as well. An important aspect of documentation is providing proper labeling of compounded preparations for others to read once dispensed from the pharmacy. While the requirements and expectations of what kind of labeling information should be present on a medication dispensed to a patient for use at home will vary from those intended for use in a institutional setting there are some expectations and requirements of both. The active ingredients and concentrations should be present as well as a tracking number (whether a batch number or prescription number) a verification of whom prepared and checked the preparation (even if just listed by initials), and an appropriate beyond use date. Chemical compatibility is a measure of how stable a substance is when mixed with another substance. Some incompatibilities are visible (color change or formation of a precipitate) and other chemical incompatibilities can be equally concerning even if not visible such as the formation of gases and volatile chemicals. An example of a chemical incompatibility is the formation of a calcium phosphate precipitate that falls out of solution when calcium gluconate and potassium phosphate are mixed together in sufficient concentration. The requirement to provide a beyond use date sometimes causes confusion as there is some ambiguity between what an expiration date is and what a beyond-use date is. An expiration date is the date put on the label of a drug product by the manufacturer or distributor of the product. Federal law requires that manufactured (compounding is not considered manufacturing) drug products be labeled with an expiration date. The beyond use date is the date placed on a prescription bottle by a pharmacy noting when that prescription should no longer be used. "The beyond-use date placed on the label shall be no later than the expiration date on the manufacturer’s container. The beyond-use date is a date after which an article [drug] must not be used. Based on the information supplied by the manufacturer, the dispenser shall place on the label of the prescription container a suitable beyond-use date to limit the patient’s use of the article." For water containing formulations, prepared from ingredients in solid form, the beyond use date is not later than 14 days when stored at cold temperatures. Generally, a two-week dating is the maximum for ointments containing water if a preservative is not present. Ointment with water are subject to microbial growth. Ointments without water can have much longer dating. Ointment jars, although widely used, expose the preparation to air and microbial contamination when opened and when the ointment is removed using the fingers. The maximum beyond use date for a very stable preparation would be 6 months or 25% of the time remaining between the time of compounding and the shortest expiration date of the ingredients, whichever is earlier. You need to consult available literature if possible and professional judgment is required in these cases. For all other formulations, the beyond use date is not later than the intended duration of therapy or 30 days, whichever is earlier. Compounding pharmacies are capable of preparing a broad array of dosage forms including capsules, tablets, oral suspensions and solutions, suppositories, troches (lozenges), various topical dosage forms (gels, lotions, ointments, creams), lollipops, and more. One of the things that tends to make compounding both interesting and difficult is finding the best way to manipulate a dosage form to benefit a patient. USP Chapter 795, Pharmaceutical Compounding-Nonsterile Preparations, codifies the rules pharmacists and pharmacy technicians must follow when compounding nonsterile formulations intended for humans and animals. This chapter provides minimal standards for equipment, supplies, labeling, beyond use dates, compounding processes, and definitions of various dosage forms. These categories are broken into Simple, Moderate, and Complex compounding. Simple compounding involves preparing compounds from USP monographs and peer-reviewed journals or even just reconstituting and manipulating commercial products within manufacturer guidelines. Required procedures and equipment are well documented. Moderate compounding requires special calculations and procedures and is generally not as well documented as Simple compounding. Complex compounding requires special training, environment, facilities, equipment, and procedures. Below is a list of equipment commonly used for nonsterile compounding. Accuracy is a chief concern when it comes to weighing (pharmacy prefers the term weight to mass) and measuring the necessary quantity of ingredients for pharmaceutical compounding. The United States Pharmacopeia (USP) allows a tolerance of plus or minus 5 percent for most preparations. Weighing items may involve a traditional prescription balance along with a set of weights or by more modern means using an electronic and/or analytical balance. A Class A prescription balance is also known as a double-pan (2-pan) torsion balance; now designated a Class III balance. Class III balances have a minimal weighable quantity (MWQ) of 120 mg and must have a maximum weighable quantity (the capacity) of 60 grams, though some will weigh up to 120 grams; you need to look at the stated capacity of the balance. The sensitivity (sensitivity requirement) of a balance is the amount of weight that will move balance pointer one-division marker on the marker plate. If you attempt to weigh something less than the balance's sensitivity requirement, the balance will give you a reading of zero, that is, the mass on the balance is too small for it to sense. A Class III balance has a maximum sensitivity requirement of 6 mg to produce a change of one index division in the rest point as shown by the balance indicator. The smaller the weight required to produce this one division displacement, the greater is the sensitivity of the balance. Electronic single-pan balances have internal weights, digital display features, and readability and precision of 1 mg; are available at relatively reasonable costs. Most find these balances easier to use and more accurate than a traditional double-pan balance. Never place weights, drugs, or chemicals directly onto a balance pan. This includes the balance pan of an electronic or analytical balance. Glassine weighing papers or weighing canoes are generally preferred for weighing. Glassine papers have a smooth, shiny surface that does not absorb materials placed on them, and drugs and chemicals are easily slipped off for a complete transfer. The paper should be diagonally creased from each corner or folded in quarters and then flattened and placed on the pans. This helps to contain the substance being weighed and prevents spilling on the balance pans or balance platform. New weighing papers or weighing boats should be used with each new drug to prevent contamination. There are some general rules about using a balance that help to maintain a prescription balance in top condition. Always use the balance on a level surface and in a draft free area. Always cover both pans with weighing papers or use weighing boats. These protect the pans from abrasions, eliminate the need for repeated washing, and reduce loss of drug to porous surfaces. A clean paper or boat should be used for each new ingredient to prevent cross contamination of components. The balance must be readjusted after a new weighing paper or boat has been placed on each pan. Weighing papers taken from the same box can vary in weight by as much as 65 mg. Larger weighing boats can vary as much as 200 mg. Always arrest the balance before adding or removing weight from either pan. Although the balance is noted for its durability, repeated jarring of the balance will ultimately damage the working mechanism of the balance and reduce its accuracy. Use a spatula to add or remove ingredients from the balance. Do not pour ingredients out of the bottle. Always clean the balance, close the lid, and arrest the pans before storing the balance between uses. Electronic and analytical balances have digital displays and may have internal calibration capabilities. These may either be top-loading or encased to protect the balance from dust and drafts. Electronic balances generally have a greater level of accuracy than a prescription balance. An analytical balance is used to measure mass to a very high degree of precision and accuracy. The measuring pan(s) of a high precision (0.1 mg or better) analytical balance are inside a transparent enclosure with doors so that dust does not collect and so any air currents in the room do not affect the balance's operation. An analytical balance is usually ten-fold more accurate than an electronic balance. If the balance has a level bubble, make sure the bubble is inside the bulls eye and make adjustments in the leveling feet as needed. Place a weighing boat or a single sheet of weighing paper on the pan. When the balance has determined the final weight, press the tare bar to compensate for the weight of the weighing boat or weighing paper. As ingredients are added or removed from the weighing boat, the digital display will show the weight of the ingredient in the boat. As ingredients are added or removed from the weighing boat, make sure the balance has determined the final weight before adding or removing any ingredient. Graduates (both cylinders and conical), volumetric flasks (such as Erlenmeyer flasks and beakers), burettes, pipettes, medicine droppers, and syringes are examples of volumetric equipment. The term volumetric simply means measures volume, therefore volumetric equipment is used for measuring volumes of liquid. Volumetric vessels are either to deliver (TD) or to contain (TC). To deliver means that the vessel must be completely emptied to dispense the needed volume. Single volume pipettes, syringes, droppers and small calibrated pipettes are TD vessels. To contain means that the vessel does not need to be completely emptied to dispense the needed volume. Volumetric flasks, graduates, and some calibrated pipettes are TC vessels. For maximum accuracy in measuring, select a measuring device with a capacity equal to or slightly larger than the volume to be measured. As graduated cylinders are usually more accurate than conical graduates or Erlenmeyer flasks we will focus on them. The general rule is to measure volumes no less than 20% of the capacity of a graduate. For example, 2 mL would be the minimum measurable quantity (MMQ) for a 10 mL graduate. Whenever you are measuring items in a graduated cylinder, you should look at the bottom of the meniscus. The meniscus is the curve in the upper surface of a liquid close to the surface of the container or another object, caused by surface tension. Water and oil based substances typically have a concave meniscus. Many facilities find it necessary to provide patient specific compounded sterile preparations including hospitals, surgicenters, ambulatory care facilities, long term care facilities, home infusion companies, nuclear pharmacies, etc. USP Chapter 797, Pharmaceutical Compounding-Sterile Preparations, provides the first set of enforceable sterile compounding standards issued by the United States Pharmacopeia (USP). USP Chapter 797 describes the procedures and requirements for compounding sterile preparations and sets the standards that apply to all settings in which sterile preparations are compounded. USP 797 is based around three categories of microbial contamination; low-risk level CSPs, medium-risk level CSPs, and high-risk level CSPs. It is important to remember that these risk categories are based solely on contamination risk and do not include any consideration of potential risks to the compounder. There are also additional requirements for compounding hazardous drugs. Low-risk compounding is performed within an ISO Class 5 (or better) environment and involves the use of no more than three sterile products and no more than two entries through a medication port. Medium-risk compounding is performed within an ISO Class 5 (or better) environment and involves more complex manipulations of sterile products including more product manipulations and potentially more medication port entries than Low-risk compounding. As long as all products and equipment used directly in compounding it is still considered medium-risk. A facility designed to prepare medium-risk compounds may also prepare low-risk compounds. High-risk compounding is performed within an ISO Class 5 (or better) environment but involves the use of either nonsterile products and/or equipment. These medication must be terminally sterilized prior to use for a patient. Terminal sterilization methods may include filtration through a 0.2 micron filter, the use of an autoclave, and/or gamma irradiation. A facility designed to prepare high-risk compounds may also prepare low and medium-risk compounds. Hazardous drugs provide additional safety concerns for the preparer. 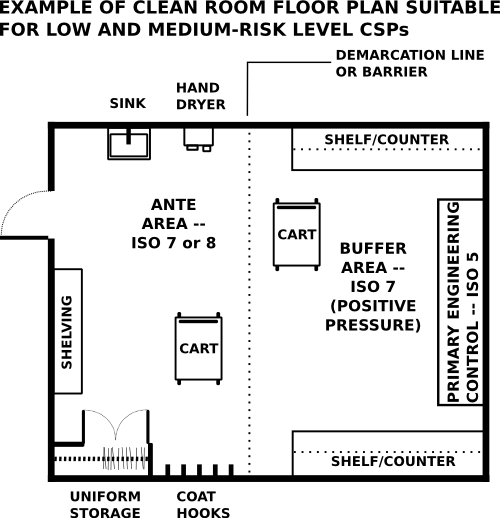 A facility that prepares more than a low volume of hazardous drugs is required to have a separate negative pressure room in which an appropriate primary engineering control will be housed. Primary engineering controls used to prepare hazardous drugs should not be used to prepare non-hazardous drugs. A facility must have an adequate design to support the risk level of compounding performed within it. The following two images are examples of potential layouts for low and medium-risk level compounding compared to high-risk level compounding and hazardous drug compounding. Pharmacy personnel will enter through the ante area where they will perform appropriate cleansing and garbing. Non-hazardous medications will then be taken into a positive pressure buffer area and prepared within a primary engineering control such as a laminar airflow workbench (LAFW) or a compounding aseptic isolator (CAI). 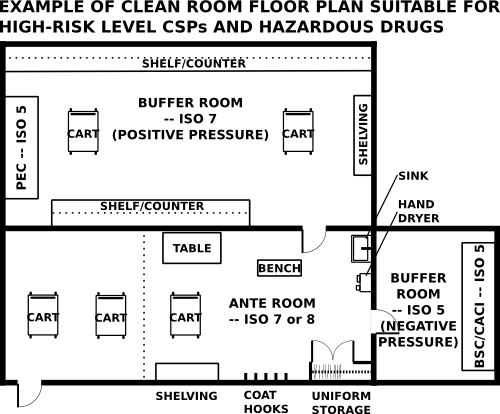 If a pharmacy prepares high risk compounds the buffer room and the ante room need to be separate rooms. If preparing more than a low volume of hazardous drugs, pharmacies will need a separate negative pressure buffer area, which will house a primary engineering control such as a biological safety cabinet (BSC) or a compounding aseptic containment isolator (CACI). Below is a list of equipment commonly used to prepare CSPs. Accuracy of measurement is a primary concern when performing sterile compounding. Measurements are primarily performed using syringes. Depending on the size of the syringe it may have markings as small as 0.01 mL on a 1 cc syringe (commonly called a tuberculin syringe), whereas a 60 mL syringe may only have a marking every 1 mL. This is why it is important to use a syringe that comes closest to the volume that needs to be measured which ideally can also contain the full quantity desired. A 60 cc syringe would not be used to measure 0.25 mL and a 1 cc syringe should not be used to measure 50 mL. Common syringe sizes include 1 cc, 3 cc, 5 cc, 10 cc, 20 cc, 30 cc, and 60 cc. Pharmacy compounding often requires pharmacists and technicians to perform various calculations in order to prepare a final product. In the following section we will review common conversions, common problem solving methods such as ratio proportions and dimensional analysis, and look at various scenarios involving compounding and calculations. As this chapter section is only intended as review, if you want longer explanation about these calculation concepts look at USP 1160 Pharmaceutical Calculations in Prescription Compounding (this chapter can be found online via a search engine) or for an even more in depth explanation with numerous practice problems look at Pharmaceutical Calculations by Sean Parsons (this can be downloaded for free at http://pharmaceuticalcalculations.org/). With respect to conversions, it makes most sense to review the English (or household) system, the metric system, and common conversions between the two. Since the ratios are equal, if there is a missing piece of data (a variable that needs to be solved for), you can cross multiply and divide to find the value of the missing data. The labels also cross multiply and cancel out as appropriate. When cross multiplying to solve for a variable, multiply the numbers that are diagonal to each other and then divide by the number diagonal to the variable. Example: Magnesium sulfate is available as 5 grams per 10 milliliters, so how many milliliters will you need for a dose of 2 grams? Notice that the grams canceled each other out since they divided into each other. Dimensional analysis (also called factor label) involves multiplying a series of fractions in such a way that units are canceled out till you are left for the units you are looking for. An additional item to help you solve percentage strength problems when setting them up as ratio proportions is to think of it as 'active ingredient over mixture'. The following are some examples of percentage strength. Example: What would be the weight, expressed in grams, of zinc oxide (zinc oxide is the active ingredient) in 120 grams of a 10% zinc oxide ointment (the ointment is the total mixture)? Example: How many milliliters of isopropyl alcohol are in a 480 milliliter bottle of 70% isopropyl alcohol? Example: If 4.5 grams of a medication is dissolved in 2 fluid ounces of solution, what is the percentage strength (you will need to convert the fluid ounces to milliliters before solving this problem)? A stock solution is a concentrated solution from which less concentrated solutions may be prepared. The stock solution diluted with a diluent (sometimes also called a solvent), which may be water or some other suitable substance. Whenever a dilution is required, the necessary math may be performed up to three different ways depending on what information is present including a series of ratio proportions, the dilution formula, or the alligation method. The following example will be solved all three ways. Example: If 500 milliliters of a 5% stock solution is ordered, how many milliliters of a 25% stock solution is needed to prepare the desired solution and how many milliliters of a suitable diluent are required? Solving this with a series of ratio proportions requires the least explanation as the concept has already been explained earlier in this chapter. 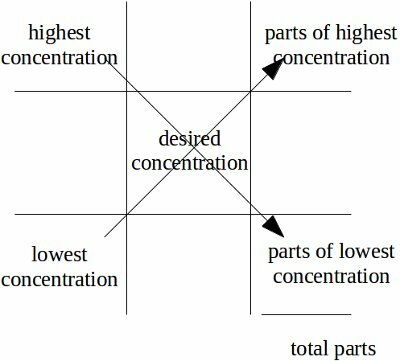 To solve the problem this way you would first need to determine how much drug is actually needed for the desired solution and then figure out how many milliliters of stock solution will be needed to provide the necessary quantity of drug. Lastly, you can subtract the milliliters of stock solution required from the final volume to determine the quantity of diluent needed. Solving this with the dilution formula requires you to plug information into the following formula and solve for the variable. Once you know both the final volume and the stock solution volume, you can subtract the milliliters of stock solution required from the final volume to determine the quantity of diluent needed. The alligation method provides another way to solve this problem and may also be useful when you are mixing two different stock solutions together in order to get a third concentration. The following is an image with a brief description of how to set a problem up this way. This provides you with a ratio that you can use to finish solving the problem. With those concepts in mind, let's plug numbers in from our example question. Sometimes you will need to determine how much to use of various products to fulfill a recipe written by a physician, sometimes you may take a recipe for a liquid medication and modify it for a different final volume, and other times you may need to either open up capsules or crush tablets and dissolve or suspend them in a liquid vehicle. Let's look at an example of each scenario. Example: How much clindamycin phosphate (the stock vial concentration is 150 mg/mL) and how much Cetaphil Lotion are needed to make the following compound? Example: A prescription is written for a mouthwash containing 170 mL diphenhydramine elixir, 50 mL lidocaine viscous, 200 mL nystatin suspension, 52 mL erythromycin ethyl succinate suspension, and 28 mL of cherry syrup to make 500 mL of mouthwash. How much of each ingredient would be needed if you only wanted to prepare 240 mL of the mouthwash? Example: How many 25 mg tablets of metoprolol tartrate and how many milliliters of Ora-Plus and Ora Sweet are needed to compound the following prescription? You will often expect the powder volume from crushed tablets and opened capsules to be negligible, but since we don't know exactly, we will simply do the math for both liquids as if all the volume was from our two suspending agents. Since they are a 50:50 mixture it means that we only need half the volume for each suspension. Sometimes compounding a semi-solid mixture (ointment, gel, or cream) can be as straight forward as mixing two semi-solids together. Other times it may require incorporating a medication into a semi-solid base. Let's look at an example of each. Example: A prescription is written for equal parts triamcinolone 0.1% cream and Lamisil cream, dispense 30 grams. How many grams of triamcinolone 0.1% cream are needed to fill the prescription? How many grams of Lamisil cream are needed to fill the prescription? What is the final percentage strength of triamcinolone in the compound? To solve this we need to first recognize that the ratio between the ingredients is 1:1 for a total of 2 parts. With that in mind, we know that half the total weight is how many grams of each ingredient we'll need. Therefore, we will need 15 g of triamcinolone 0.1% cm and 15 g of Lamisil cm. Next, we need to evaluate the final percentage strength of triamcinolone in the compound. There are 2 ways to do it, one is to calculate just how much triamcinolone is in the mixture and then figure out its percentage strength, the other is to also divide by 2 like we did the total weight. Both ways will be demonstrated, but recognize that you only have to do it one way to achieve the correct answer. Obviously the second way was easier, but it is good to know that you will get the same answer either way. It is also noteworthy that the methodology used in this example will apply to any compounding problem where you are mixing ingredients in equal parts. Example: If 50 g of salicylic acid ointment contains 10 grams of salicylic acid, what is the percentage strength of salicylic acid in the ointment? Some medications come from the manufacturer as a lyophilized powder in order to provide them with a longer shelf life. Some medications have a negligible powder volume and others have a more significant volume. Whenever looking at a powder that has been reconstituted, you must be aware of the resulting concentration of the medication, whether it is an oral medication labeled as 400 milligrams per teaspoon or injectable medication with a concentration of 250,000 units per milliliter. Let's look at an example with respect to a powder intended for reconstitution. Example: If a 20 gram vial of cefazolin Na is reconstituted with 192 milliliters of sterile water and contains 8 milliliters of powder volume, how many milliliters of the reconstituted solution will be needed to provide a 1 gram dose? Example: A physician orders cyclophosphamide to be given 5 mg/kg in a 50 mL D5W bag. If the patient weighs 132 lbs and the concentration of the drug after reconstitution is 500 mg/10 mL, how many milliliters will you need to withdraw from the vial and add to the bag in order to prepare this admixture. Body surface area (BSA) is the measured or calculated surface of the human body, and it is measured in square meters (m2). For many clinical purposes BSA is a better indicator of metabolic mass than body weight because it is less affected by abnormal adipose mass. There are a number of weighs to calculate, but one of the simplest is the Mosteller formula. Example: If a patient is 6' 1" tall and weighs 176 lbs, what is the patient's BSA? Example: A physician orders bleomycin in a dose of 20 units/m2 for a 5'3" patient that weighs 110 lbs. How many units of bleomycin should the patient receive? This page was last modified on 18 February 2014, at 03:04. This page has been accessed 157,244 times.